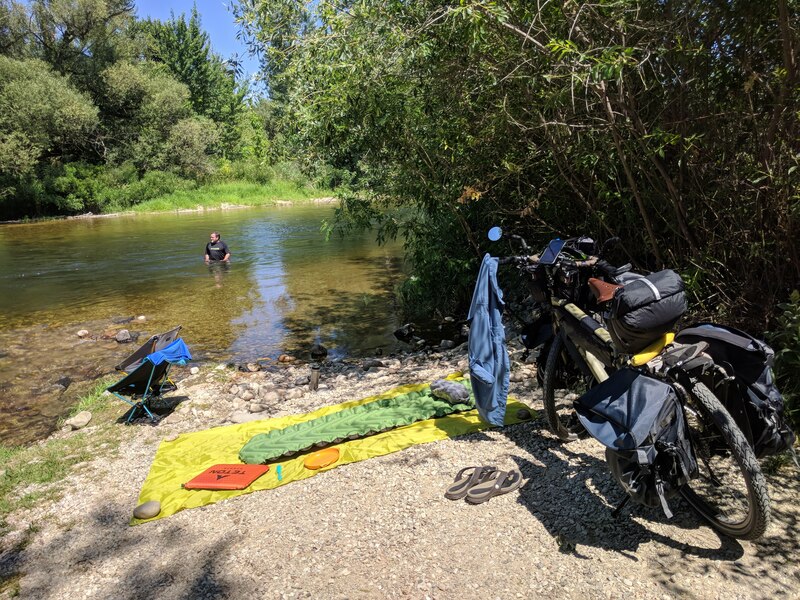 The Boise River…where our bicycle adventure vacation idea came to be. After months of gut busting workouts and long distance rides, weeks of planning, and days of packing/unpacking/re-packing the moment has finally come—Our great escape into the Idaho wilds! Excited would be an understatement as we have been looking forward to this trip for what feels like an eternity. 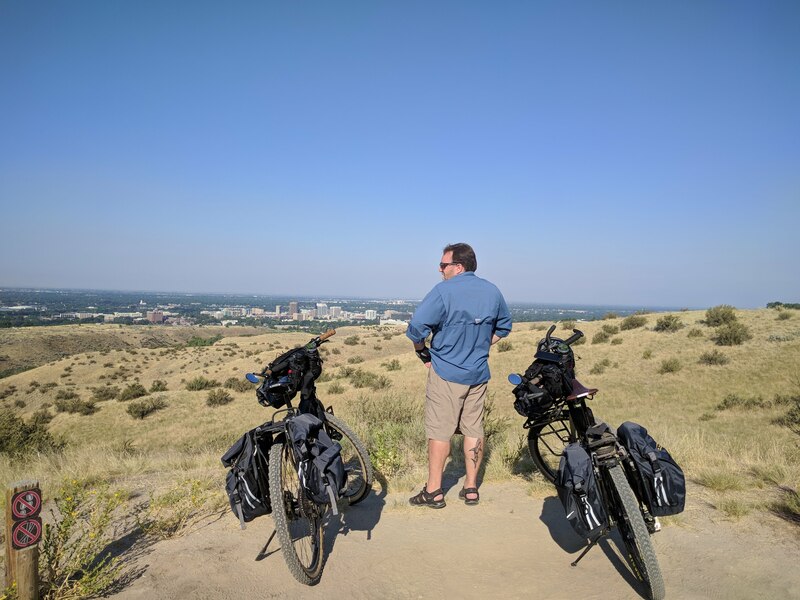 Training ride in the foothills which overlooks the booming city of Boise. Another training ride along the river. We always seemed to get side tracked by the call of cool river on a hot day! 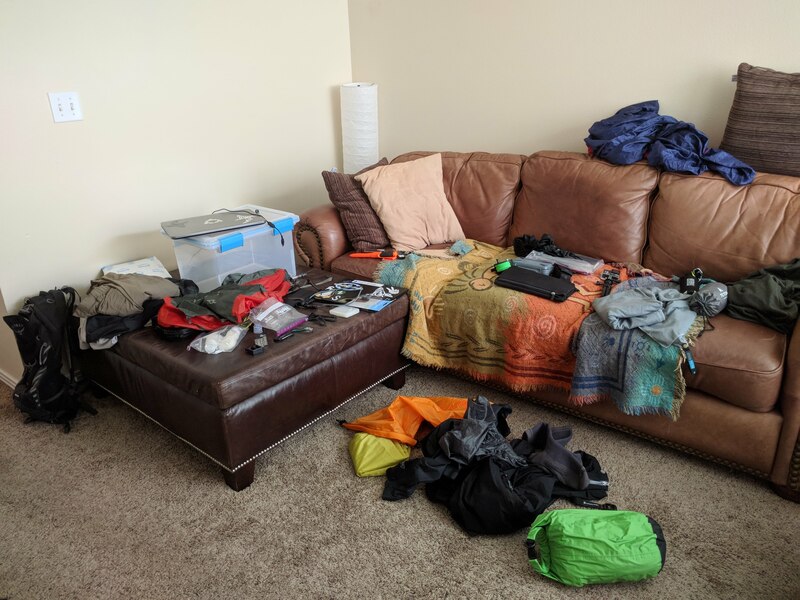 This summer we got a lot practice under our belts, tried out all of our gear, and now we think we can conquer one the the ACA’s most difficult routes second only to The Great Divide. Perhaps we will try that one next! haha. Meal planning was also a lot more challenging than I expected. We ended up buying a LOT more food than we needed. Our trip to Avery 3 weeks ago helped us realize how little we really needed to eat to sustain our energy levels. At least we have cabinets full of goodies for our next trip! When I’m constantly exercising, the last thing I think about is food—until AFTER of course—then I could eat just about anything! 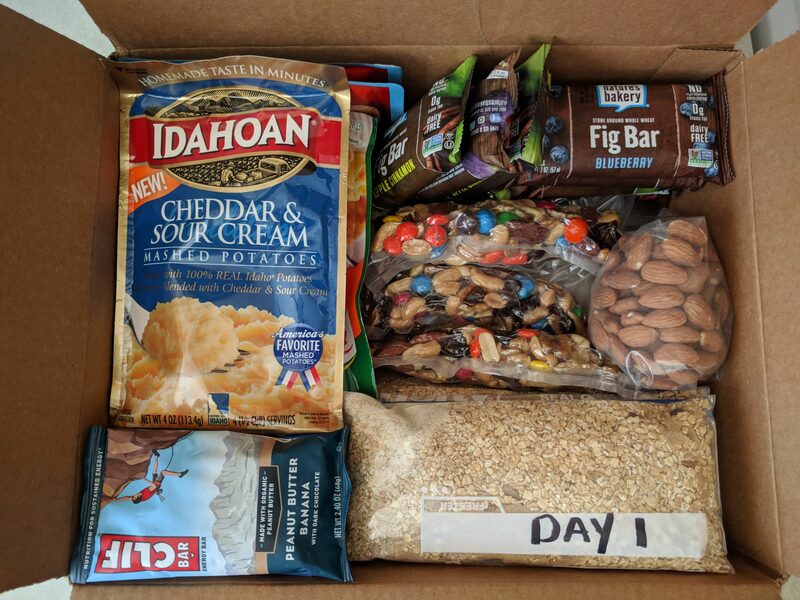 During the day, when we do need to eat, the meals usually consist of a bar here and a small handful of trail mix there. Eric: I like to call his approach, The Tasmanian Devil. Imagine a grown man rummaging through the kitchen. 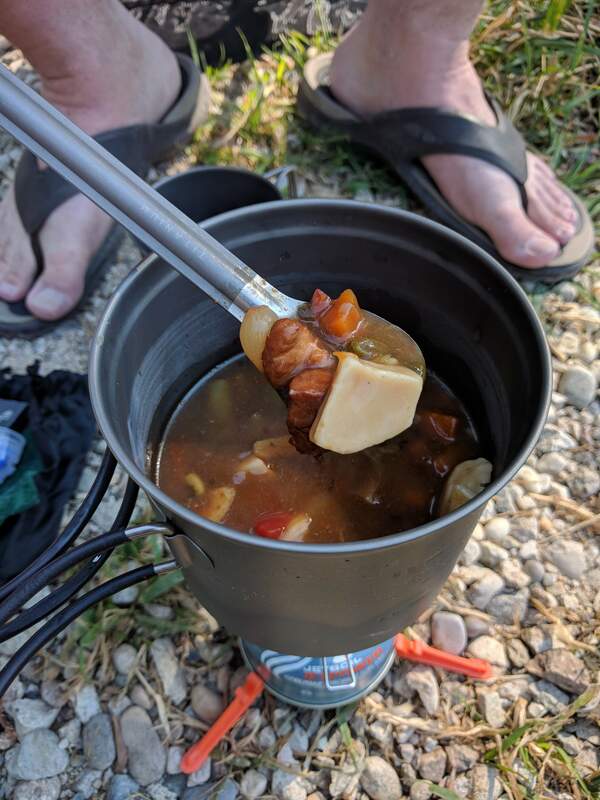 Throw some bars in here, a pack of potatoes in there, eh…maybe some trail mix. Counting days? Ha. Why would I take time to do that? He may have 3-8 days worth of food depending on how well he “eye-balled it”. Me: Totally OCD. Everything was a calculated and packed to a perfect fit. Picture worthy as seen here. haha. Guess what? At the end of the day, we’re both still going to eat and chances are we’ll both still have more food than we’ll even need. If not, I’ll just swipe some out of Eric’s stash. Thankfully we each will save about 8 lbs since we don’t have to carry so much water! Feeling grateful for Sawyer water filters and Idaho Rivers. Sammy is ready to see the world! Meet our mascot Sammy. He will be joining us for some of our trips because he is a LOT more photogenic than either of us care to be. Ok. That is a lie. I try to be photogenic. It’s Eric that tends to hide from the camera or if I do happen to catch him, he’ll make grumpy or silly faces (which is why I’ve learned to take pictures of his backside). See…..A perfect example of my most bestest friend doing what he does best….smiling on the inside. I’m convinced if I keep trying, I will eventually get a good photo of him. So far he is winning, because after 6 years together, I have 2. Oh well, I personally like these photos the best. Silliness aside….oh wait, we have 1 day left! 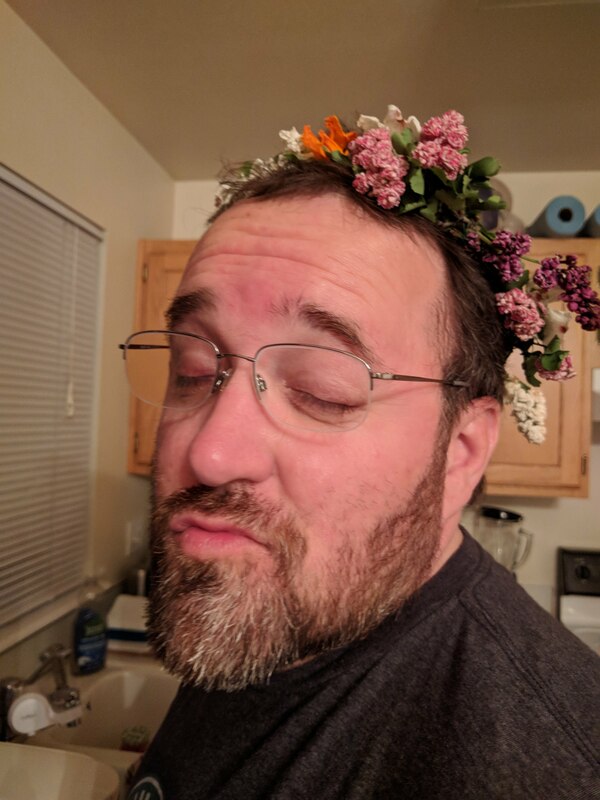 There is ALWAYS time for more silliness in the Davis household. 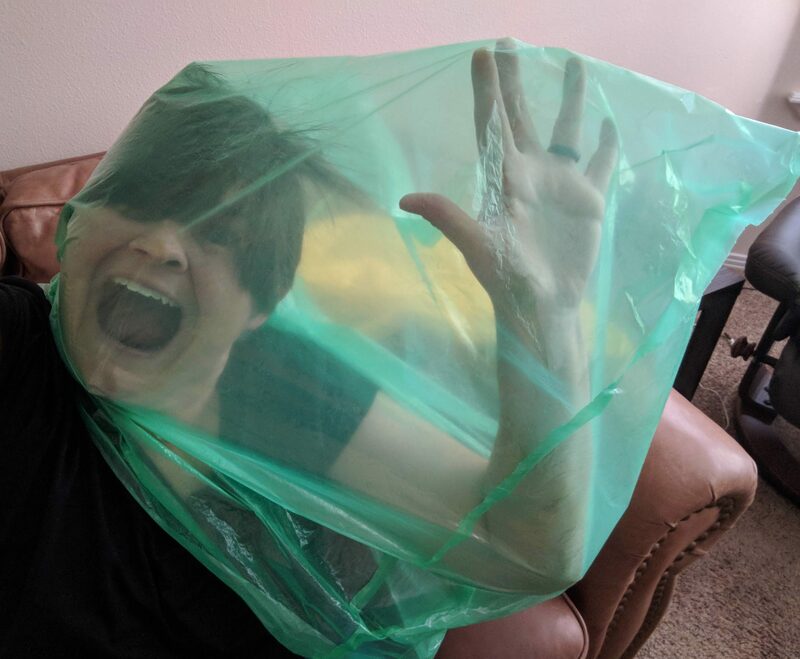 It momentarily seemed like a fantastic idea to put myself inside the bear bag until that whole suffocation thing became a reality. Bear proof jump suits…my next creation. I can’t believe we leave tomorrow! I feel somewhat like this is a make it or break it kind of trip for us. We have big ideas and dreams for our future and this trip is a bit of a test to see if we have what it takes to lead a life on the road. 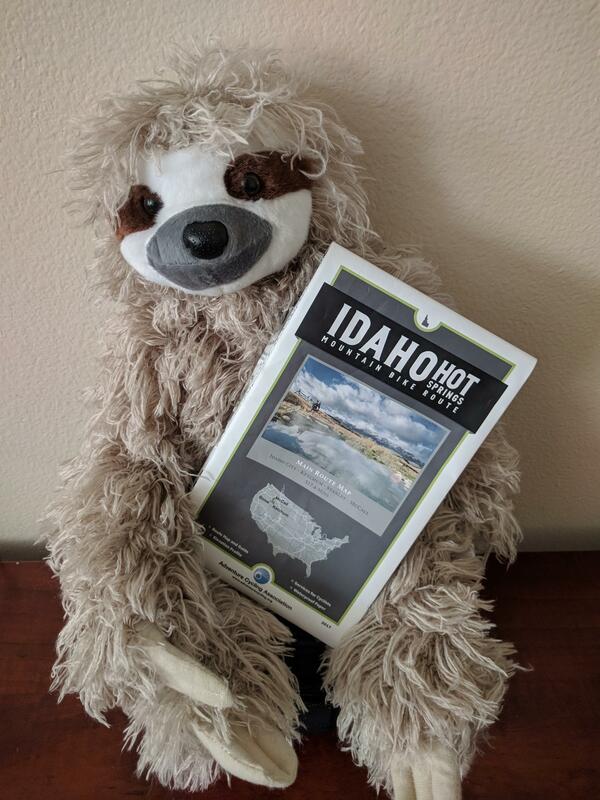 Our dream of “Life in 4 Bags” may soon be a reality in the form of Cycling Sloths. Here’s where I will put a plug in for our Instagram page. 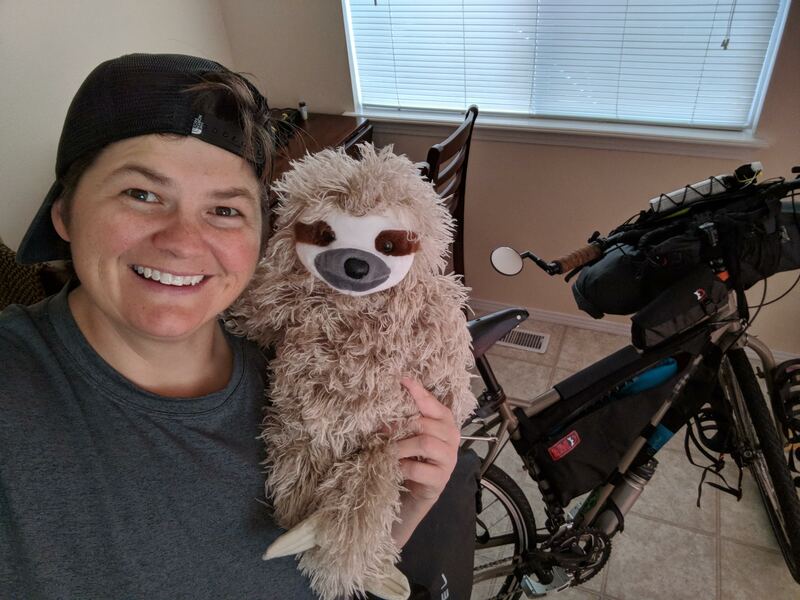 Check it out for photos and updates along the way at cyclingsloths. 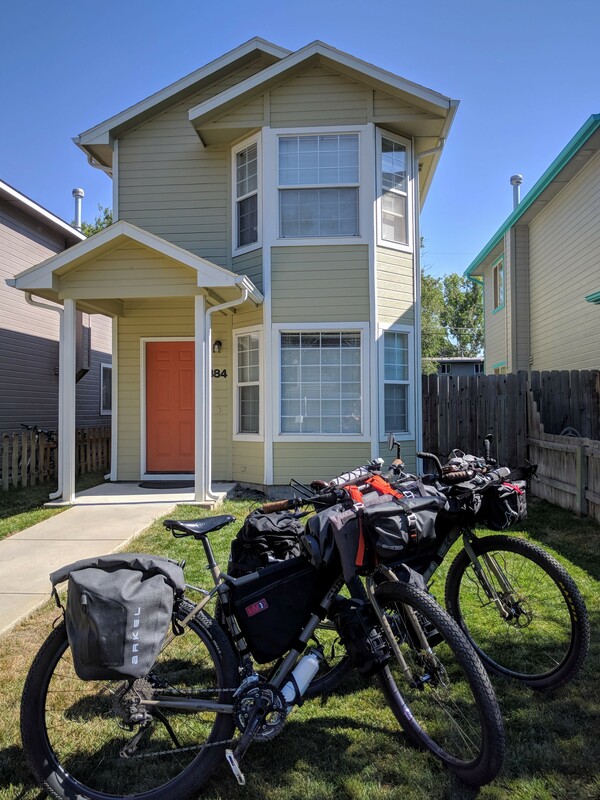 It’s the day before we take off, the bikes are packed and loaded—no turning back! We’ll be taking off from this very spot at oh-six-hundred. Thank you for all of your words of encouragement! This is probably the most challenging thing either of us have ever done (at least physically). So, keep the positive vibes coming! This will likely be my last blog update for a while, but I will try to post some photos on Instagram when we have wi-fi along the way (which will NOT be often!). I’m thrilled for the two of you. Only a few hours before takeoff. Be safe and have a fantastic trip. Sending love your way and yes I will be praying for NO BEAR confrontations. It’s what will keep your Momma sane on your trip. Love you. So happy you are doing this for yourselves!! You know we are in the area a lot don’t hesitate to call if you need something! Please lets get together when you get back. so Jealous of your adventure. we need to get toghether afterwards and see all the pictures on a huge screen. Praying for a great adventure and safe travels. That would be so fun! After 1 week, I already have almost 500 photos/videos. lol We hope to make a short movie..maybe I’ll plan a party for something to do this winter when it’s cold!